Paid sick days certainly won’t stop the spread of all food-borne illness – although as Steve notes, it is an important part of any food service provider’s plan to protect workers and patrons alike. The Seattle Yacht Club’s paid sick days policy – and their response to this outbreak – exemplifies a response that is good for their employees, businesses and customers. In March 2011, the Seattle Times reported that an outbreak of norovirus closed the Seattle Yacht Club for nearly a week. The outbreak, which sickened at least 150 people, was determined to be norovirus by the Seattle-King County Health Department. [Club commodore Kim] Lorenz said one employee who was ill, but then returned to work, could have passed on the virus. But the outbreak at the Seattle Yacht Club wasn’t an isolated case. The Centers for Disease Control reports that the norovirus, which commonly results in nausea, vomiting and diarrhea, is highly contagious. Passed through contaminated food and by sick people, norovirus sickened 21 million Americans last year — fully half of which stemmed from ill food service workers. In Seattle, the Seattle-King County Public Health Department received reports of 124 outbreaks of foodborne illness from 2006 – 2010. Of these outbreaks, 71% were caused by a pathogen passed from person-to-person, while 26 cases were linked to an ill foodworkers with symptoms of norovirus. Also from 2006-2010, the Seattle-King County Public Health Department received 244 reports of norovirus outbreaks in nursing homes, daycares, schools and skilled nursing facilities. Because of high levels of contact with vulnerable populations, these are the only types of facilities in Washington required to report norovirus outbreaks. When sick workers can stay home and get healthy without losing a day’s pay – whether at a restaurant, daycare or at a nursing home – they are less likely to transmit dangerous diseases like norovirus. 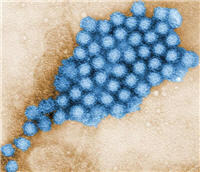 It also helps prevent a public health crises, like the 2007 norovirus outbreak in King County. 1. Urge the Seattle City Council to introduce a paid sick days ordinance in May and give it a public hearing in June. 2. Show your support by sending in a postcard –and getting your friends and neighbors to do the same. We’ll deliver your card, along with thousands of others, to council members this summer. 3. Ask your local business owners whether they provide paid sick days (or the equivalent) to their employees. If they do, thank them! If they don’t, urge them to think about how paid sick days can make their business a healthier place to work and shop. This entry was posted in Healthy workers, In the news, Paid sick days, Personal story and tagged seattle, seattle times. Bookmark the permalink.